I had already owned several of the Novaform bath mats for some time now. The foam on that mat is so soft and so comfortable and perfect for my bathroom floor. The Novaform Home Kitchen Mat 20” x 42” makes a good addition to my kitchen. Ever have to wash a seemingly endless amount of dishes after a dinner party? Have your feet and legs gotten tired? 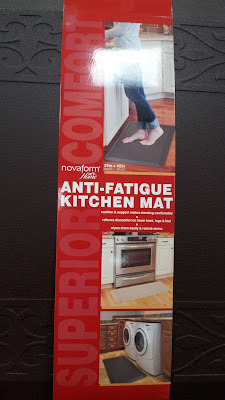 Then the Novaform Home Kitchen Mat 20 x 42 would do nicely to help alleviate the pain of washing dishes. I also like the fact that it is stain-resistant, slip-resistant, and comes in a bunch of colors. 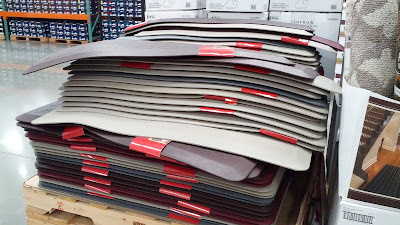 Costco also has the Apache Mills Soft Stand Kitchen Mat and The Chef’s Kitchen Resilience Cushion Mat which are a bit cheaper as well. Novaform Home Kitchen Mat 20” x 42” Anti Fatigue. Stand on a New Kind of Comfort! 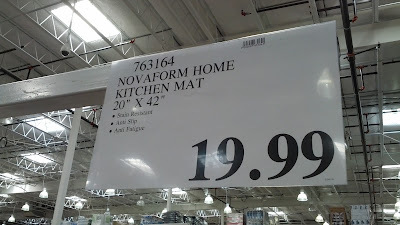 Introducing the Novaform Home Kitchen Mat. This top-of-the-line mat provides superior cushion and support and is proven to relieve discomfort on feet, legs and back. It’s easy to clean, stain and mildew resistant, and has a slip resistant bottom that stays in place. Durable and backed by a 20-year limited warranty. Available in the Versailles pattern in multiple colors that complement any kitchen decor.